Fresh ripe tomatoes, garlic, parsley, cilantro, and paprika and cumin are usually key to Moroccan pasta sauce, with common variations including the addition of cinnamon, hot peppers, or even chickpeas. The pasta dish itself is often topped with grated Edam cheese. The basic Moroccan pasta sauce recipe below will yield 4 to 5 cups of zesty sauce, enough for up to 1 kilogram (about 2 pounds) of spaghetti or pasta. Marble-sized kefta meatballs are a classic but optional addition. If your kids are unfamiliar with Moroccan food, they'll love these mini meatballs! If you're in a hurry and don't want to take time to stew tomatoes, replace the fresh tomatoes with an additional 280 grams (12 ounces) tomato paste, thinned with water to tomato sauce consistency. Blend the ground beef, spices, garlic, and parsley. Knead the mixture well, and shape it into tiny meatballs the size of marbles. Set aside. Peel, seed and chop the tomatoes. (OR you can quarter the tomatoes and stew them, covered, in about 1/4 cup of water for about 5 to 8 minutes, until the skin pulls off. In a large, deep skillet or wide pot, heat the vegetable over medium heat. Add the chopped onion and garlic and saute gently just until the garlic is fragrant; be careful not to burn the garlic. Add the stewed or chopped tomatoes, the spices and about half of the parsley (reserve the rest of the parsley to add at the end of cooking). Mix the tomato paste with enough water to make a sauce and add it to the pot. Stir to blend, and bring the sauce to a simmer. Cook, uncovered, stirring occasionally, until the sauce is reduced and thick, about 30 to 40 minutes. If the tomatoes were chopped instead of stewed, mash them with the back of the spoon as they cook. Taste and adjust the seasoning, and add the meatballs and remaining parsley. Simmer for a few minutes longer, or just until the meatballs are cooked through. 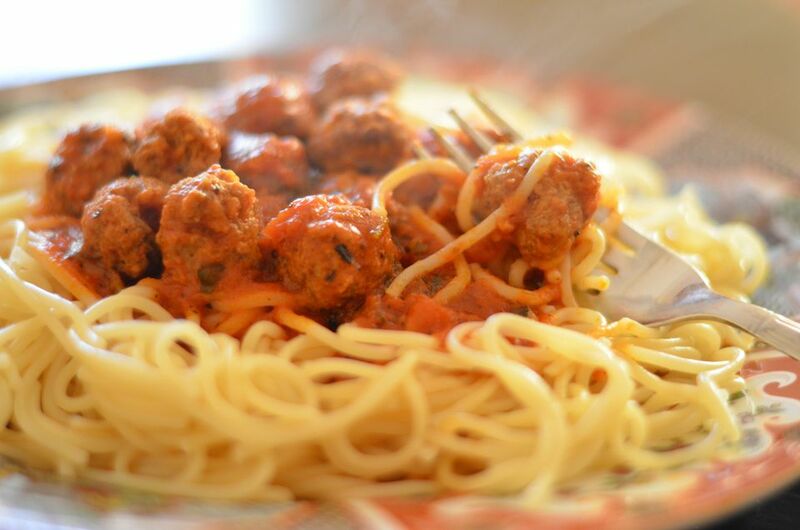 Remove from the heat and serve over spaghetti or another pasta of your choice.